Hanukkah, the Jewish festival of lights, has many fun and interesting traditions that date back over two thousand years. Traditions include giving gifts, eating foods fried in oil and playing traditional Hanukkah games. Hanukkah gift giving comes from the tradition of giving Hanukkah gelt. Gelt was the name for small coins given to children on Hanukkah. In America, the traditional giving of gelt evolved into the giving of more elaborate gifts that we see today. Traditional Hanukkah foods are fried in oil to celebrate the miracle of Hanukkah in which the oil in the sacred lamp burned for eight days even though their was only enough oil for one. 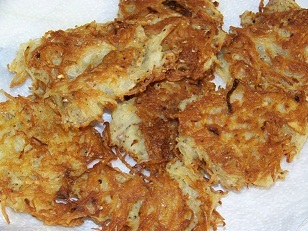 The most common fried Hanukkah foods are latkes (potato pancakes) and sufganiot (donuts). Every night of Hanukkah a candle is lit on the nine branch candelabra called a menorah, or chanukiah. Special blessings are said over the candles every night and then many families sing holiday songs. This is why Hanukkah is often called the festival of lights. The game of dreidal is traditionally played every Hanukkah by the children. A dreidal is a four sided spinning top with a different Hebrew letter written on each side. Each child places a few pieces of candy in a central pot, and then spins the dreidal. Depending on how the dreidal lands the player either wins everything, wins nothing, wins half, or has to add to the pot. Whether you’re eating latkes by candlelight or playing dreidal with your cousins, Hanukkah traditions are a fun way to enjoy the Jewish festival of lights. Happy Hanukkah!